DOES THIS LOOK SCARY ENOUGH FOR YOU??? I'm using this jam as an excuse to practice my pixel art. Usually I spend my time looking for unique gameplay ideas, then scrambling through the art. 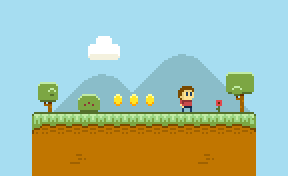 This time will be about starting with art and implementing it into a simple platformer mechanic. Update: It was featured in "New Games We Love" on the U.S. App Store on Oct 31, and EU on Nov 3. Featured in over 100 countries. This is Level With Me, a somewhat ridiculous balancing arcade game set to launch on iOS around Oct. 20. (and on Android soon after.) The game trailer above should give a good idea what it's about. 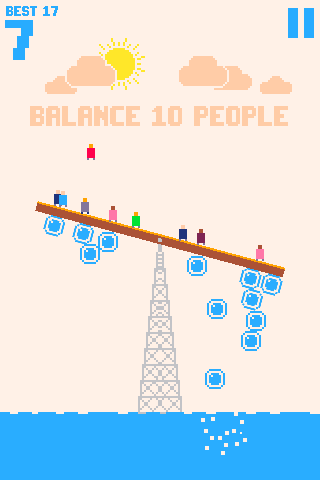 You are tasked with balancing random objects or characters on a beam with the use of bubbles from the sea below. But each level has been crafted to have unique goals and challenges, such as making a burger or getting the rotund hedgehog to pop the balloons. A few new levels unlock as you progress. I'm proud of how it turned out. It's very different from my previous mobile titles, Hue Ball and Lava Bird, and I believe it is a unique gameplay experience that is still fun and challenging. Big thanks to Folmer Kelly for helping me nail down the art direction. LAUNCH DATE: Probably around Oct 19. MONETIZATION: Free with occasional ads. iAP to remove ads. ErrorMessage = ERROR ITMS-90164: "Invalid Code Signing Entitlements. The entitlements in your app bundle signature do not match the ones that are contained in the provisioning profile. According to the provisioning profile, the bundle contains a key value that is not allowed: '[ "XXXXXXXFN6.com.unept.GAMENAME" ]' for the key 'keychain-access-groups' in 'Payload/GAMENAME.app/GAMENAME'"
The App ID bundle in the error contains an App ID prefix XXXXXXXFN6. That prefix is tied to my Wildcard App ID. However, the App ID bundle that I created for this app uses my Team ID prefix XXXXXXXFA9. The FN6 doesn't show up anywhere that I can see during the whole process, but it ends up inside the Game.app file in the application signature after it's built. I discovered it using command line tool described here: How do I check the entitlements on my Application's Signature? Notice how the application-identifier and keychain-access-groups contain FN6, while the team-identifier contains FA9. I don't recall why I have multiple App ID prefixes. And I have no idea why this app is somehow tied to more than one of them. - Reset certs, profiles, clean build, etc. as instructed, multiple times. - Google. Nothing shows up from Stencyl forums, and very, very little else from StackOverflow, Github, etc. - Uninstalled Xcode. Deleted plist files. Reinstalled Xcode. - I'm running Stencyl 3.3.2 b8734. Xcode 7.1 until current reinstall to 7.2. I am at wit's end here. The answer may be right under my nose, but I don't see it. Any help? UPDATE: It was looking for 1.5x images, which I had turned off. I need to test further to confirm, but so far it looks like that's what it was. I'm trying to get Hue Ball to work on Android. I'm finding that it works perfectly on some devices but not at all on other devices. - Doesn't work on Samsung Galaxy Tab 3 running 4.4.2. It simply shows a black screen for 1 second, then closes out the game again. It is not registering any crashes or ANRs to my Google Play account. It exports an APK file just fine. I'm running Stencyl 3.3.1 b8398, JDK 8. For the moment it's available on the Google Play Store, if anyone would like to try it out there. Logs attached, if it helps. Hue Ball (formerly Colornundrum) is live on the iOS App Store. UPDATE: Hue Ball is now in the Google Play Store. Let me know what you think. Any app store review would be super helpful. I've been working on this game on and off (mostly off) since last August. I feel very good about how it turned out. UPDATE: It looks like it got featured in Best New Games in the App Store. I'm surprised, honestly. Your device's ios version must match your computer's ios version ("AMDeviceinstallApplication failed: ~402653058"
But in both cases, they refer to adding a profile to Xcode, but it doesn't work for me. The Xcode Organizer window is empty. When I double-click to install a provisioning profile, nothing happens in Xcode for the 5s. I have a feeling something is not working correctly in Xcode. (6.1.1) I don't think my Organizer is supposed to be empty. It wasn't before I upgraded to 6.1. But I don't even know where to begin troubleshooting Xcode. It's like a jungle in there. - I have tested all "versions" in Stencyl Settings > Mobile > Versions, from 8.1 to 5.1.1. - Google comes up with practically nothing for "AMDeviceinstallApplication failed: ~402653058"
I get the below java error when I open any game in Stencyl 3.1 (b7918). Stencyl still seems to work OK, as far as I can tell. Anyone care to translate? Below is screenshot of the same game before and after I upgraded to 3.2 (b8059). On the left you see that the circles are pretty crisp with no dirty outlines. On the right, you see the black outlines. I have tried a couple things to fix this, like re-importing graphics, cleaning them up from the games folder after importing, changing display settings from 4x to 2x, etc. Nothing seems to be working. I've done this before and it didn't seem that difficult. My window to get out of the Kong abyss is closing fast. Any help? If you don't know/remember GregAnims (Greg Sergeant), he's the genius behind Skullface, Making Monkeys, Demonic Dungeons, and more. In the past he was a big contributor on the forums and big proponent of Stencyl. He taught me a ton about game design, level design, and player psychology as I was designing Disposabot (which, by the way, has nearly 1 million plays), so I'm grateful to him for that. He has moved on to Unity for most of his games, and now has a project up in Steam Greenlight. Watch the video and read the description, and vote YES. It looks like all of the fun elements of DayZ plus some GregAnims creativity packed into a nice little game. UPDATE MAY 11: It's called Hue Ball and will be released on May 28th, I think. See my May 11 post below for details. A few years back, when I was playing around in GameSalad, and very new to game design, I designed a game called "Colornundrum" for iOS. I was never satisfied with the game I created—it contained way too many hacks and felt clunky—so I never published it. Then I dove into Flash games and Stencyl and forgot about it for a while. So now that Lava Bird for iOS is "complete," I'll begin working on this new game. I've already created a dozen mockups, and have already tested out a few basic prototypes. It has a lot of potential, especially on mobile. Hopefully I'll keep this Game Journal updated regularly (definitely not daily or weekly) in order to help myself and possibly add to the community. - Ball bounces around, hitting existing blocks and destroying them. - When ball stops, it creates a new block. - If ball hits bottom, you lose a life. 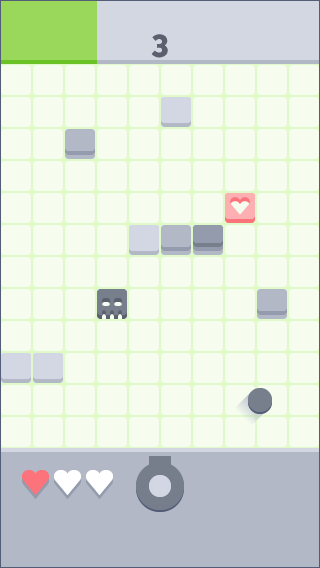 - Destroying n blocks earns a level up, giving you a point, but also increasing strength of existing blocks. - Skulls are blocks that have not been hit for multiple level ups. They don't go away. - Most of these elements listed above may change.